that President has emotionally expressed saying, "I ousted Ranil Wickremasingha from his position on 26th October and I had to do it because he was an utterly corrupt person. He was corrupted. His finance policies are not good for local industries. He followed a sheer liberal system of government which does not suit our culture. I just could not bear it". When the President was questioned whether it has been proved anywhere that he is a corrupted person, the President has responded saying, "I will take action to appoint a Presidential Commission of Inquiry to look for corruption and frauds that took place from 2015 onwards under Ranil's government. Then we can see". In this instance the journalists had asked the President is't it that the leader of the UNP which is the singular biggest party be appointed as Prime Minister, he had responded saying that, "I work according to tradition and the tradition is that the person appointed as Prime Minister should be someone who is able to work with the President. It can't be done with Ranil. As long as I live he will not be made Prime Minister from me". Finally the foreign journalists questioned what the solution is for this situation where the country is in a confused state with Mahinda not having a majority. President Maithripala has then said, "if the majority is there ... the United National Party can can bring another person". 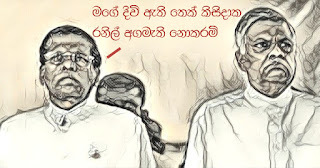 Towards October 26th too when the position of Premiership was changed, what President had said was that if Ranil is appointed that he (President) will not remain in the President's chair for even an hour.